Highlights of this Broadway Extravaganza Walking Tour include the origins of musical theater and the history of Broadway and famous songs and show stoppers (performed with your tour guide!). As you explore Manhattan's Theater District, learn about Broadway stars and New York City's theater culture from Vaudeville to today. Get ready to show off those jazz hands and join us in celebrating musical theater on this amazing Broadway Musical Theater Walking Tour Extravaganza! For 2 glorious hours you will be taken on a fun-filled, historical, memorable walking tour through either the Northern or Southern boundary of Times Square, or upgrade to experience the whole district on a 3-hour option. 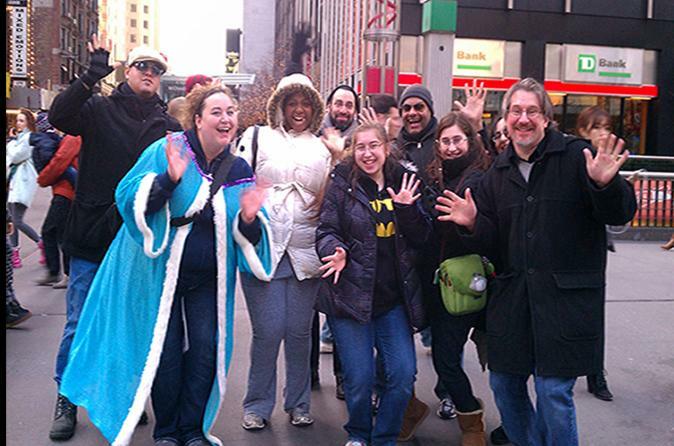 Professional licensed tour guides are gifted triple threats who weave groups around New York’s bustling streets, brandishing their love of the stage and of the city along half-mile routes that cover origins of musical theater and Broadway history. Each tour guide brings a tablet with photos and videos to help share New York’s unique theater history. You will hear backstage stories and visit The George M Cohan Statue, Shubert Alley, Sardi’s Restaurant, Broadway Souvenir Store, Gershwin Theater lobby where Wicked is currently playing. This is a MUST for Broadway fans!